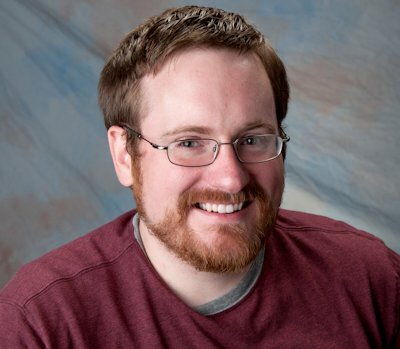 Please welcome Brian McClellan to The Qwillery. The Crimson Campaign, the second novel in The Powder Mage Trilogy, was published on May 6th by Orbit. TQ: Welcome back to The Qwillery. Your new novel, The Crimson Campaign (Powder Mage Trilogy 2), was published earlier this month. 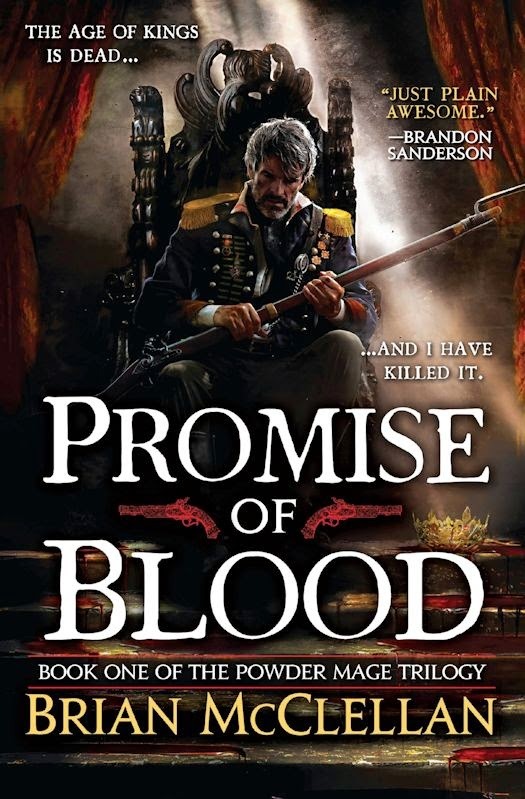 Has your writing process changed (or not) from when you wrote Promise of Blood (2013) to The Crimson Campaign? What is the most challenging thing for you about writing? Brian: Thanks for having me back! The writing process did change. Crimson Campaign was the first novel that I wrote under contract. This meant I now had deadlines, an editor to report to, and agent to keep in the loop. This is all opposed to Promise of Blood, where I could take as much time as I wanted and had no outside force to report to. I tend to write intuitively. Sporadically. This doesn't gel well with deadlines. If a scene isn't working I have a hard time going on ahead, and will often set aside my writing for days or even weeks while I try to figure out exactly where the book is going. I hate the phrase "wait for inspiration to strike" because it implies you're not in control of your own world, but that is literally what I have to do at times. Let me tell you, agents don't like hearing about that when you're closing in on a deadline and still have half a novel to write. TQ: What do you wish that you knew about book publishing when Promise of Blood came out that you know now? Brian: I wish I knew how uncertain the industry really is. No one really knows how a book is going to do until it hits the shelves. They can guess, of course, which is where they get the numbers for advances and marketing budget and all that. But it's not a lot more than an educated guess among a bunch of experienced people. No guarantees. Okay, on second hand, I don't think I would have wanted to know that. It was nerve-racking enough to have my first book come out. TQ: Tell us something about The Crimson Campaign that is not in the book description. Brian: I had always kind of wanted to do a work that was based on Xenophon's Anabasis. It's a true story of a Greek mercenary company stranded in enemy territory and having to fight their way back home. The Crimson Campaign isn't as huge in scope as that (I had envisioned this Anabasis¬-inspired work as a whole series), but it has a lot of those elements to it. TQ: Please give us one or two of your favorite non-spoilery lines from The Crimson Campaign. Brian: This might be a cheat, but my favorite line often ends up on the front cover: "The hounds at our heels will soon know we are lions." TQ: What kinds of research did you do for The Crimson Campaign beyond that for Promise of Blood? Brian: My research rarely goes beyond Wikipedia, to be honest, and I can't remember anything specific to Crimson Campaign that I hadn't already had to learn or figure out for Promise of Blood. TQ: Which character in the The Powder Mage Trilogy (so far) has surprised you the most? Who has been the hardest character to write and why? Brian: I think Bo has surprised me the most. He was meant to be a bit of a throw-away character, and he wound up being the most fun to write. That shows with his extra screen time in Crimson Campaign. The hardest character is definitely Nila. She doesn't have a lot of screen time in Promise of Blood and only a bit more in Crimson Campaign, nor was she meant to. I knew from the beginning that her story was going to be important, and I had some idea why, but I wasn't 100% sure what her journey would be. I'm glad to say that changed as things went along and by Crimson Campaign I knew her destiny. Still, she winds up being ignored by a lot of readers because of her lesser screen time. TQ: The Powder Mage Trilogy is Epic Fantasy. I've also seen it called Flintlock Fantasy. What appeals to you about writing Fantasy? What is Flintlock Fantasy? Brian: I grew up reading and loving epic fantasy. When I decided I wanted to be an author, I knew that was the genre I wanted to write in. 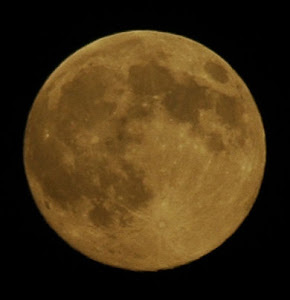 I like the scope of it, and how it can deal with both personal, human relationships and world-shaking events. I like the good versus evil aspect (though I do ignore that trope to a certain extent in my own books). To me, flintlock fantasy is just epic fantasy taken to the logical conclusion of a magical world entering its industrial revolution. It's meant to be epic. It's meant to be a successor to Jordan and Eddings and all those guys I loved as a kid. I hope that readers see it as epic fantasy and not as a separate genre entirely. TQ: The 3rd and final novel in The Powder Mage Trilogy, The Autumn Republic, will be published in February 2015. Please give us a sneak peek of what to expect. No spoilers, please! The war escalates. The fighting becomes more personal. The enemy shows his true colors. Mistakes are made. Friends become foes and foes become friends. People die. A republic is born. TQ: Will you be writing more in the Powder Mage world? Brian: Yup! I'm under contract for another three books in the same universe. These ones will be set in Fatrasta ten years after the end of The Autumn Republic. We'll see a lot of new faces and several familiar ones, and the emergence of a new world power that threatens even the Nine from half a world away. I'm also working on more Powder Mage short fiction to self-publish. I finished the first draft of a new novella just the other day and I'm hoping to have it out sometime in June. Brian: Thanks again for having me! Tamas's invasion of Kez ends in disaster when a Kez counter-offensive leaves him cut off behind enemy lines with only a fraction of his army, no supplies, and no hope of reinforcements. Drastically outnumbered and pursued by the enemy's best, he must lead his men on a reckless march through northern Kez to safety, and back over the mountains so that he can defend his country from an angry god, Kresimir. In Adro, Inspector Adamat only wants to rescue his wife. To do so he must track down and confront the evil Lord Vetas. He has questions for Vetas concerning his enigmatic master, but the answers will lead Adamat on a darker journey. Tamas's generals bicker among themselves, the brigades lose ground every day beneath the Kez onslaught, and Kresimir wants the head of the man who shot him in the eye. With Tamas and his powder cabal presumed dead, Taniel Two-shot finds himself as the last line of defense against Kresimir's advancing army. In a rich, distinctive world that mixes magic with technology, who could stand against mages that control gunpowder and bullets? THE CRIMSON CAMPAIGN is the epic sequel to Brian McClellan's Promise of Blood. In November 2011, The Powder Mage Trilogy sold at auction to Orbit Books. 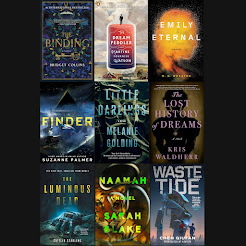 Book one, Promise of Blood, is out now from Orbit Books. 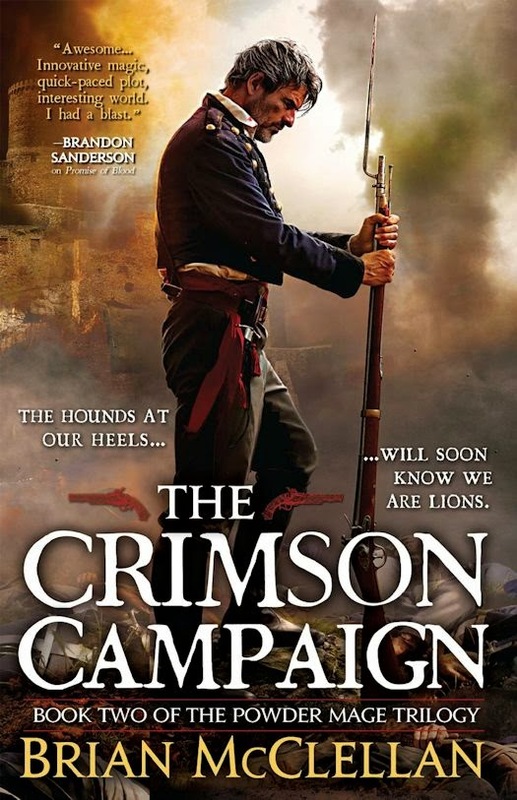 Book two, The Crimson Campaign, is due out in May of 2014. What: One entrant will win a Trade Paperback copy of Promise of Blood (The Powder Mage Trilogy 1) by Brian McClellan from The Qwillery. This copy will not be purchased at Amazon. Who and When: The contest is open to all humans on the planet earth with a mailing address. Contest ends at 11:59PM US Eastern Time on June 7, 2014. Void where prohibited by law. No purchase necessary. You must be 18 years old or older to enter. 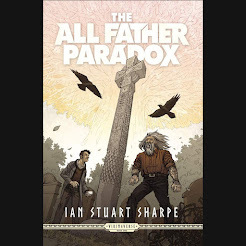 This is one my favorite fantasy series right now and I can't wait to see what happens a decade in the future in the same world. Thanks for the great interview! I would love a chance to read this book :) Ummm... I"m gonna go classic with Anne McCaffery. Favorite fantasy novel? That is like asking for my favorite strand of hair. Too many. But some highlights: Outlander Diana Gabaldon, WoT Robert Jordan, Mercy Thompson series by Patricia Briggs, Dresden Files by Jim Butcher, Kingkiller Chronicles, Patrick Rothfuss - and oh so many more. Start of an exciting new universe! My favorite fantasy novels (can't pick just one) are Terry Brooks's Shannara books. I have many favorite fantasy novels :) And with its great action and excellent worldbuilding this series has definitely found its place among them. My favorite fantasy novels was the Belgariad series by David Eddings. I love the way David Eddings was playing with words in the story. I think this will become a favorite trilogy. Pern... or Xanth, or wait maybe Tolkien, but then there is The Belgariad or The Wheel of Time, oooh and of course Discworld.... AHHH too many to choose! Anyways, I do have a question.... "This copy will not be purchased at Amazon." huh? I am thinking maybe there is a story here? I have enjoyed the fact that Mr. McClellan has written several novellas allowing the readers/fans to fill in the back story and become more intimate with the world he has created.